The March 2015 Oregon Regional Economic Indexes of was released today. Full report is available here. We thank KeyBank for their generous support of this project. Moving average measures of activity – which smooth monthly volatility – indicate that all areas are growing above their average pace of activity. Recall that “zero” for these measures indicates relative average growth; each region has its own underlying growth rate. Salem’s measure pulled solidly above zero on the back of a reduced drag from housing permits and generally stronger employment data. Housing permits and labor force numbers dealt a setback to the Rogue Valley, but the moving average measure indicates the underlying positive trend continues to hold. 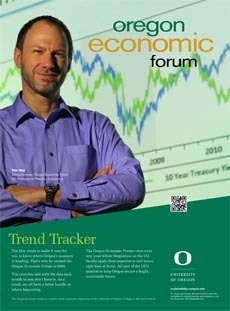 Central Oregon’s measure held strong as the region continues its impressive rebound from the recession. Generally solid numbers across a wide range of indicators support a solid underlying trend in the Portland metro region. The Eugene-Springfield region measure continues to track sideways at a level somewhat lower than that seen in past expansions. Note that slow to declining growth in the civilian labor force was a drag across all regions, offsetting somewhat the positive impact of low unemployment rates. The current pattern of flat to negative labor force numbers is not consistent with the experience of past expansions in Oregon; it is reasonable to expect that stronger economic activity and in-migration will reverse this trend.